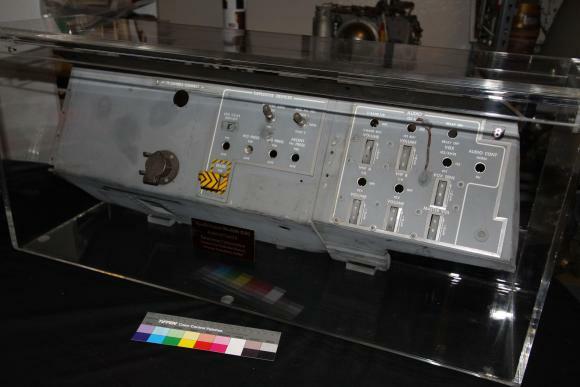 Lunar Module Control Panel #8, mounted to the left of the Commander's station, The panel contains switches to actuate the Explosive Devices Subsystem,Descent Propulsion and Audio. This panel was a test article, and includes thermal couples used to evalute performance when exposed to simulated vibration and temperature extreme's. While a number of switches are no longer present, the rear of the panel retains intact most of the electrical umbilicles and beta cloth covered connectors.